The Environment Agency is working with its partners to reduce flood risk in Oxford. 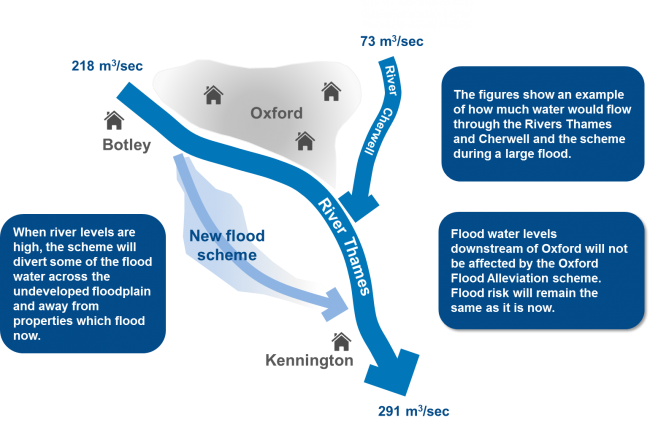 What is the Oxford Flood Alleviation Scheme? The Environment Agency is working with partners Oxfordshire County Council, Oxford City Council, Vale of White Horse District Council, Thames Water, Thames Regional Flood and Coastal Committee, Oxford Flood Alliance, Oxfordshire Local Enterprise Partnership and University of Oxford on a scheme to reduce flood risk to homes and businesses in Oxford, as well as to services and major transport routes into the city. Oxford has the second fastest-growing economy of all UK cities and the scheme will keep Oxford open for business and allow this successful economy to continue to thrive. The scheme will involve lowering parts of the floodplain and working on some of the existing rivers and streams that run through it to make more space for water and reduce flood risk to the city. Some areas will have new flood walls and embankments. As well as reducing flood risk, the scheme will create 5 hectares of new wildlife habitat and improve existing public footpaths and bridges, creating opportunities for everyone to enjoy the environment and improve health and wellbeing. Oxford is home to around 5,300 businesses, provides 133,000 jobs and has approximately 7 million visitors every year. Everyone who lives, works in or visits the city will benefit from the reduced flood risk to the railway and the Botley and Abingdon roads. The scheme will reduce flood risk to homes and businesses to the south and west of the city. There will also be fewer flood related electricity, telephone and internet disruptions to homes and businesses. Over 80 properties will be less likely to experience sewer flooding. The scheme is designed to reduce the impacts from a major flood. This size of flood has not been seen in Oxford since 1947. If the scheme had been in place during the floods of 2007 and 2013/14, the Abingdon Road, Botley Road and railway would all have remained open. The scheme will be approximately 5km long, it will run from north of Botley Road down to south of the A423 southern by-pass where it re-joins the River Thames. Negotiations will be continuing with landowners to obtain permission to use their land. If an agreement cannot be reached, the Environment Agency will seek to use Compulsory Purchase Order (CPO) powers to allow the flood scheme to go ahead. Defra has confirmed that they intend to hold a Public Inquiry. A date is being confirmed for this. The planning application for the scheme is currently being considered by Oxfordshire County Council and it is hopeful that a final planning decision will be made in Summer 2019. The plan is to then submit the full business case for the scheme to Government. Construction should start in 2020 and is expected to take 3 to 4 years. 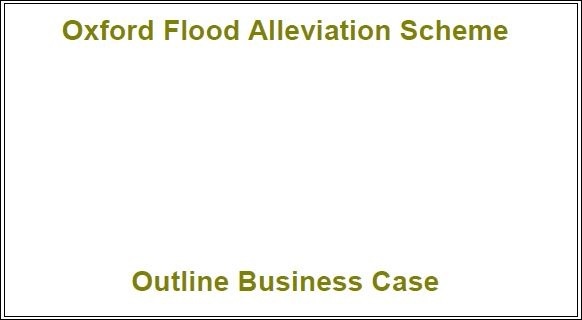 More details on the scheme can be found in the Full Outline Business Case and Executive Summary. Previous newsletters: June 2016, December 2016, April 2017, August 2017, November 2017, March 2018, December 2018, January 2019.